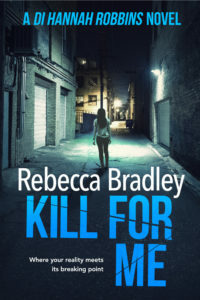 Yesterday I blogged chapter two of Kill for Me. Today you can read Chapter three. The phone rang. Lucy waited, vibrating with shock and fear. Had she done the right thing to run away from the school, from Mr Hughes. He had wanted to help her, to shepherd her into the safety of the school building, but Lucy had bolted. She had taken heed of the words on the screen. Her first instinct was to protect her daughter and that meant following the orders that were directed at her. But now, as she listened to the familiar tone of a ringing phone, she wasn’t so sure of herself or her actions. Surely the police were best placed when a child had been taken? What the hell had she done? Would they really hurt her baby? How was she supposed to know? She had no idea who they or he or even she was. All Lucy knew was that Faith must be terrified and she had to get her back home safe. The phone rang off. There was no answer. Lucy pulled it away from her ear and stared at the screen. No answer. How could they do this to her? They must have demands. Instructions. Something they needed so that she could get Faith back. They didn’t just want Faith. In fact they had implied if she went along with them that she would see her again. So they must want something in exchange for her. Suddenly Lucy had something to cling onto. She clicked into the text message again to confirm what she had figured out. Do not alert the police or you will never see her again. Or you will never see her again. Yes. This implied that if she didn’t go to the police that she would see Faith again. Her heart lifted in her chest. She was going to see Faith again. It would be okay. All she had to do was what they said and Faith would be home. Lucy scrubbed a hand over her face, frustration driving her every movement. She needed them to answer the phone so she knew what she had to do. She dialled the number again. A woman walked down the street, at the side of the car, hand-in-hand with a young boy. He looked to be about the same age as Faith. Probably in the same nursery and had been collected on time. He was skipping, his mum’s arm waving along with him as he jolted her about with each little jump. Oh Faith, Mummy is coming to get you. I will give them anything for you, sweetheart. The dialling tone ended again. Lucy screamed into the steering wheel. Why wouldn’t they answer? How could she give them what they wanted if they wouldn’t answer? She jumped in her seat. An elderly gentleman was stooped over peering into the car. Lines ran out from his eyes and underneath them. His skin soft looking, like fine dough she would be able to knead if she reached out and touched him. She pressed the button and the window moved down an inch. She so wished he could do something to help her. Lucy realised she hadn’t answered him as his face pushed to the window. She placed her palm against the glass. The coolness seeped into her skin. Grounded her a little, reminded her of where she was and what she was doing. ‘No. No, thank you.’ She was so grateful for his thoughtfulness, but she needed for him to go so she could call the number again. The phone pinged in her hand. Lucy jumped. Her heart flew into her mouth. She scrabbled about, nearly dropping the phone in the eagerness to get the screen to face her. It was the same unknown number. ‘Are you sure you’re okay?’ The old man sounded concerned. ‘Yes, yes, thank you.’ She pushed the button and the window back up. The old man pursed his lips at her and scratched his head. He muttered something under his breath and turned and walked away. She pressed through to the message. Go home and await instructions. That was it. Go home and await instructions. They expected her to just wait? In this state? She was expected to wait? She pressed the dial button again and listened, but instead of it ringing out the call was rejected. She pressed through again, and again the call was rejected. She wanted to scream again but she would draw attention to herself and she had no idea how this was going to play out or what she was going to do. She was still parked outside the school. She could still go inside and call the police. Do not call the police or you will never see her again. And I will know, trust me on that. What, did they have a scanner in her head?! She couldn’t risk Faith’s life. She had to do as they said for now and maybe change her mind later on, depending on what their demands were. Why were they even doing this? It wasn’t as though she had any money to speak of. She worked part-time in a doctors’ surgery. Lucy looked back at the school. The bell had been rung, the kids were queuing with their teachers to go back inside. Parents were dropping the afternoon children off. Safety was back there. But not safety for her. Not safety for Faith. Safety for Faith was back at home. Look out for tomorrow’s blog where you’ll be able to read chapter 4. 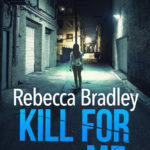 If I ever needed a crash course on the perfect way to write a thrilling novel, this is it! Ooooh, the tension is building! Waiting for that phone call which never seems to come. Unable to speak to anyone about it. What next for poor Lucy? This is great, Rebecca!! You really put us in Lucy’s shoes in a potent way!